Poeme is a newest and most well-built Multipurpose Theme suitable for Fashion, Food, Home Rugs, Pottery, Vegetarian Seeds & Nuts, Decoration. 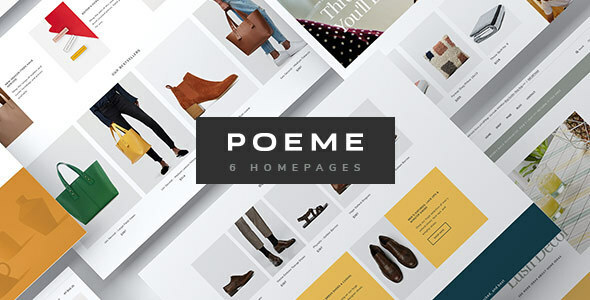 As an Elegant & Functional WooCommerce WordPress Theme, Poeme possesses many amazing features that meet your expectations for helping you to build up and develop your own website professionally in a short time. This great Theme is so impressive with 06+ Modern, Charming Homepage Demos creatively designed by the powerful Elementor Page Builder with Drag & Drop Widgets struck with Diverse eCommerce functionalities. Scroll down to explore how wonderful Poeme is and how passionate we stuff on it! Why do you fall in love with this Universal – Smart Multi-purpose WordPress Theme? Because it not only is perfect for appearance, but it also can meet your all expectation for all functions supported inside. Firstly, you can utilize an amazing Page Builder – Elementor to customize and build web pages right on the frontend fast and easily with intuitive interface and great visual display. Another amazing part is Real-time customizer! You can customize the block’s layout, color, typography, margins, padding and see changes instantly! With a huge library of widgets available, you are well supported to illustrate your business research services in the best way. All you have to do is Drag and Drop widgets. Also, you will find it easy to install and import demos with One-click Import tool. Everything you want to have on your site is currently available in Poeme – Design-driven multipurpose theme with zero coding required. You don’t need to be a tech-savvy to make it! For an extremely responsive, fast-loading, SEO-friendly Versatile WordPress Theme, Poeme is your solid choice to create a thousand of sites that never be repeated.